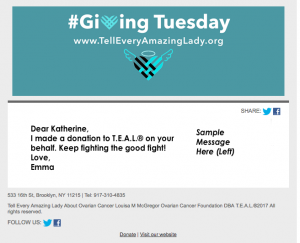 Along with the national organization Turn the Towns Teal®, Tell Every Amazing Lady® promoted awareness about ovarian cancer in Brooklyn on August 20th, 2018, and September 14th, 2018. On these dates, T.E.A.L.® held a ribbon tying campaign in Brooklyn on 5th Avenue, North Flatbush Avenue, and Myrtle Avenue. T.E.A.L.® supporters, with the help of the local Business Improvement Districts and volunteers, tied teal ribbons around trees in honor of September being ovarian cancer awareness month. Thank you to Turn the Towns Teal® and to the many volunteers who helped us turn Brooklyn teal!